Here is the perfect working desk designed for modern interiors. It has plenty of storage space – two drawers, a niche and even a tiny drawer for small things in the table. It also has two pockets on the bench. As you can see – enough space for all your work related things. It was created by Moh Portuondo Alvarez and we have to admit that it just looks amazing. This stunning table is called ‘SmÃ¶ly Desk’ and it can perfectly fit in any interior. The furniture pieces are made of rich coulored wood without using any glue, screws or metal. 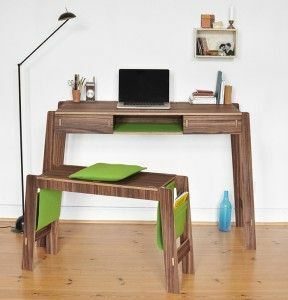 Rich brown and bright green colours make this working desk looks modern and neat, ideal addition to any interior! It’s perfect piece of furniture for your home office because it doesn’t take much space and it really looks good – wherever you put it!